If OpsCenter authentication is enabled, follow these instructions to log in and out of OpsCenter and change the default admin password. Note: After changing the hash algorithm for the password_hash_type, instruct users to log in again so that OpsCenter can rehash and restore the user passwords. Because password hash algorithms are one-way functions that cannot be reversed, logging in again is necessary to update previously hashed user passwords. Go to the main OpsCenter URL in a web browser. A login dialog appears. Enter your username and password. The default admin username is admin and the default admin password is admin. Click the admin username on the upper right and select Change Password. Enter the current password, enter the new password, confirm the new password, and click Save. 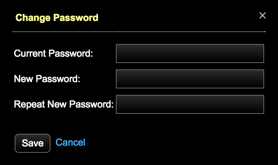 The Password Updated dialog indicates the password has been updated. Click Close. Log out by clicking your username in the top navigation bar and clicking Log Out.